Recruitment is a process every organization takes very seriously as recruitment is the process by which potential employees will hire. Manpower always plays a critical role in the success of the business and hiring the right person for the job is much more important. Recruitment is always a tedious process for any organization simply because manpower affects the organization to a far higher level and often lots of research is done to get the best out of employees and how to hire the best candidate. Managers, recruiters often have a discussion about Talent recruitment and how to hire them, but they hardly get through their ideas and make the real plans for hiring top talent. In this article, we are going to discuss top talent and how to hire them, but first, let’s start with what makes for top talent. What Makes for a Top Talent? There are many types of research about top talent and what exactly it means, but the definition of top talent depends on the need of the job and organization. Here we are focusing on some of the common features that usually all top talent shares because their job may differ, but success has only one key and there is no shortcut to reaching the top. The common features that make top talent are. Seriousness is what an employee needs to excel in the job, but the top talents have seriousness for the job and they never take it lightly. Seriousness for the job is what separates them from the ordinary employees because an ordinary employee never maintains that seriousness towards the job and often stir away from the responsibilities or show a lack of seriousness towards the job. Commitment is one of those features of top talents that make them special. A top talent never steps back from the commitment and make sure he/she fulfil his/her commitment on time, whether it is a professional life or a personal because a person can never understand the commitment professionally without following it in personal life. Curiosity is the key to many answers & solutions, and a top talent never hides his/her curiosity. Top talents always seek questions that bother them and always eager to absorb more information no matter the source of the information. Top talents can see a circumstance from various edges, making them compelling issue solvers. Creativity is one of the important features of top talent and they see every situation as an opportunity to do something new and turn it into something useful. A top talent never stops growing or learning and that makes them the top talent. A top talent never competes to win, but to excel and usually, the competition is to become the best version of own. Intelligence not just comes from education or experience, but it also comes from our emotion. A top talent has a good balance of emotional intelligence which is important for handling critical issues and also helps in maintaining a healthy work environment. Most top talent has great analytical skills which help them in finding an opening in each critical situation. Each person is different and has different qualities, but still, we can categorise qualities that are common in top talents. It is easy to find one or two qualities in almost all the candidates who apply for the job, but finding a candidate who is top talent is not that easy because most recruiters often misjudge qualities or the nature of the qualities. Here are defining qualities of top talent. Top talent achieves results because it is what they do. They work hard to get the results. The efforts of top talents are always given results and most of the time they are better in their work and give far better results than any ordinary employee. Top talents are always the favourite one of all. Employees seek their help and they are the go-to person in their workplace because they are the one who has more knowledge and understanding. A top talent doesn’t need motivation from the outside world. They are self-motivated and never stir from their aim or target which ultimately help them in motivating. A top talent hardly satisfies with the current situations. Top talents always do more than what was enough because their definition of enough usually exceeds norms. Top talents have the quality of being a good team leader and a team player. They easily go along the team because of their knowledge and focus which is always on the target and they are a good team leader because they know what they are working for. When a recruiter posts a job on the job portal, hundreds of people apply for the job. Spotting a top talent is one of the critical things because interviewing hundreds of candidates can be tiresome. There are many cases when recruiters hire wrong candidate out of frustration from the long recruiting process. Here we are mentioning some of the qualities that can really help in spotting top talent, but one thing recruiters must understand is that top talents are not always found in the interviews. There are chances that they are already working for someone else. So you can spread your network and can make efforts to bring the top talent in the organization, but before that you should know how to spot top talent. The people who believe in themselves and know their capabilities have confidence. Confidence comes from strength and the knowledge that yes, you can do it and do it mighty fine. Confidence is one of those qualities you can easily look in top talents because they are highly comfortable with their own self and know very well. A top talent takes accountability for all his/her action, whether fruitful in a good way or bad because they have that sense of responsibility. A top talent never plays the blame game and tries to learn from each past mistake and that is something to look for top talent because usually, people blame others for the mistakes they had done in the workplace. Top talents deal with the complex situation far more confidently than any regular employee because they are dedicated and have the patience to work harder on the complexity. Dealing with the complexity is another way to spot top talent because an employee that deals with complexity confidently and patiently is a true gem. Multitasking takes more than just top talent, but a top talent always has hand in more than one task all the time no matter the circumstance and the workplace. So always notice the quality of multitasking in top talent simply because multitasking comes from discipline, dedication, and love for the work they are doing. A top talent never sticks to the norms or age old beliefs because they are always up to new ideas and ways to do the work. A top talent always seeks innovation and play actively in new innovations so that they can get the best from their work. Top talents are innovative and it is an important quality to look inside to spot top talent. Decision-making skills are important for the employees as it helps in their growth and in the growth of the company. It is another important factor of top talents; they have great decision-making skills and make a quick and effective decision. Most companies want to hire top talents because it is the sure way of success. There are few things that most companies look in for top talents. These successful organizations aren’t reluctant to find the top talents from a different organization or force top talents from different enterprises. There are three qualities that are most important to an organization while hiring: mentality, competency, and attitude. A positive attitude and excitement to work with the organization are what to look for in the top talent because talent without right attitude is more problematic rather than having an ordinary employee. Having a talent is one thing, but having the right skills to do the job is more important or the willingness to learn because without the competency, talent is not much of use. An employee must understand the benefit of teaming up with associates and comes to work each day searching for approaches to enhance the execution of the organization and expanding the effect he or she can have. There are organizations out there that have teams of recruiters to look for top talent and they search top talent in all the available sources. Recruitment is always a bit critical task as hiring new employees have lots of impact on the workplace and the organization, but still, an organization hires new employee all the time. Hiring a top talent is much more difficult because you have to first recognize them, but even after recognizing it takes a lot to make a top talent to work with you and according to you. Here are some of the best hiring practices you can have in your organization to make sure that they hire a top talent and retain them well. Having a well planned, thoughtful, innovative process that you actually follow is what you need to recruit the top talent. 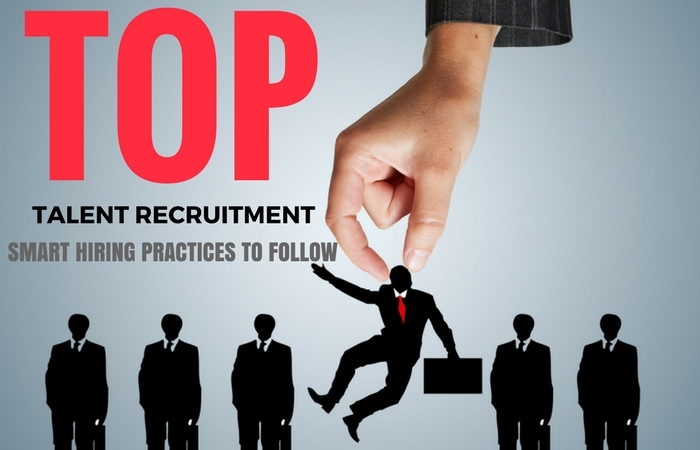 Without a well-planned process and execution, you cannot ensure the top talent recruitment in your organization. Actually, the problem is we make plans for hiring top talent, but never make plans how we are going to do that which eventually lead to failure of the hiring plan. So make plans and design a process, test it and if it works fine then apply the process to hire top talent and make sure it goes according to plan. Invest in best recruiters who have enough experience to spot the top talent and ability to actually hire them to work for you. It may look a costly investment, but the outcome is much more precious and in order to ensure the recruitment of top talent you have to take tough decisions. Treat recruitment as a sales function where you have to sell a position within your organization with such convention that the top talents accept working with you. People with talent want to work in a place where they can learn, grow and improve further. You have to make them believe that your organization is the right choice but make sure it actually happen otherwise there are other organization who wants to hire them. Hiring managers are those people who actually hire the top talent or any employee. Create a comfortable environment for the hiring managers because they work under so much pressure and maintain a healthy relationship with them. Analyze top talents that are working for you and their recruitment process to identify the best possible recruitment process to hire top talents. Use strategies, techniques, and data from previous recruitment to understanding what the best procedure to hire top talents is and what are the improvements you can make in your existing process. Talent is what any organization wants and talent is what every organization seek to achieve success. Top talents are not that hard to find but giving them an environment to flourish is important because they will give their best only when they feel they have scope for progress. We hope this article can help you in locating and hiring top talent for your organization. On that note, good luck.